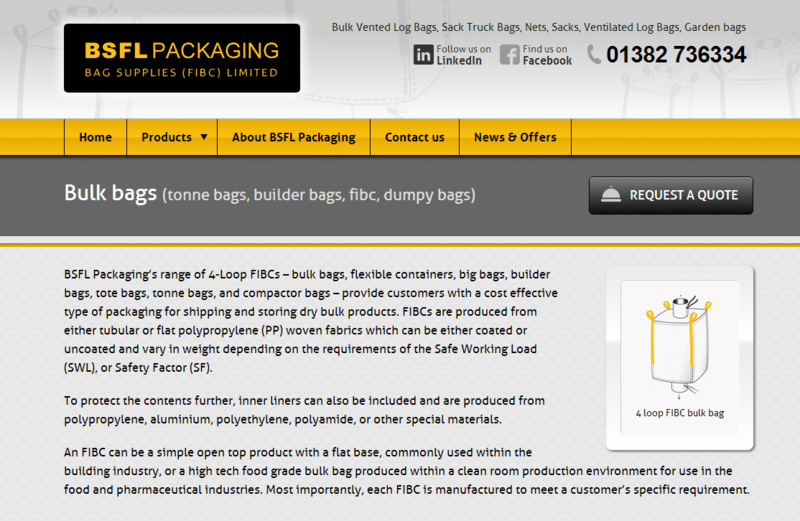 BSFL Packaging are a Dundee-based firm who specialise in bulk packaging. They had an existing website that was not helping them to create the impression they wanted, and was also not helping to bring in new customers and leads. As a small company they wanted to “punch above their weight” with their website the same way they do with customer service and pricing. After considering a number of designs, we narrowed it down to a single design that used their key yellow/black combination but resulted in a brighter more colourful layout. 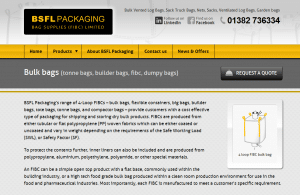 We developed this into a fully responsive website theme and added a number of contact forms, including a “call to action” – Request a Quote – button on product pages to help gather leads from product pages. As is often the case with smaller organisations, the content available was limited and because of the very specific nature business, it was difficult to source more via stock image libraries, etc. Bearing this in mind, the new site was designed to use as much of the old content and media as possible, but expand upon where possible. Additionally, some tweaks were made to the existing images so they would better fit into the new design. SEO services are a very imprecise deliverable. Many companies “guarantee” you a certain position on Google, which is often misleading, and can even involve actions that will go on to hurt – not help – your website with regard to search engine rankings further down the line. 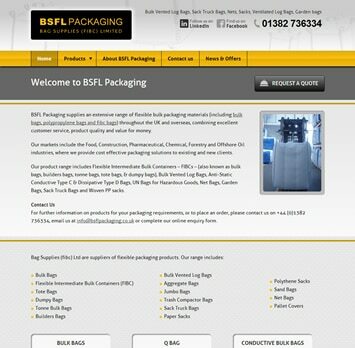 From the outset BSFL made it clear they would like some help with Search Engine Optimisation (SEO) services. We started by designing a template that was “Search engine friendly” – with a structured layout and then added some functionality to the template to help guide them when writing content. Links to social media, a search engine optimised XML site map and a blog completed the on-page SEO help. To avoid losing the traction that the existing site had, we redirected each individual page to the corresponding page on the new site using 301 (permanent) redirects in order to preserve any page rank and also included a message at the top of the new site welcoming any visitors who arrived there via redirection. The hard work we all put in paid off, with the new site ranking highly on Google for key phrases, as high as page one in some cases. SEO is based on a number of factors however, and is more like a marathon than a sprint. We have given BSFL the tools to keep improving their website visibility, and compete with much larger players in their marketplace.